DreamWear Full face features three frame sizes and four nasal cushion sizes, so you can find the fit that works best – and is the most comfortable – for you. Innovative design prevents red marks, discomfort or irritation on the nose bridge. DreamWear Full face mask combines the innovative hose on the top of your head design with a full face cushion that prevents red marks, discomfort or irritation on the nose bridge. 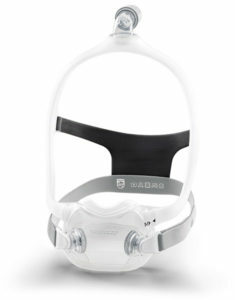 * Design claim – the design of the mask is such that it does not contact the nasal bridge. ** Data analysis of Aug 2017 Patient Preference trial where n = 85 and prescribed masks include Resmed Airfit F10 and F20, Respironics Amara View and F&P Simplus; based on 10 days of use.